We’re heading into the Holiday Season and there’s no better time to join Dance Hearts/ Bells of Freedom Program to “adopt” military families from Camp Pendleton in what is called “The Big Thank You”. 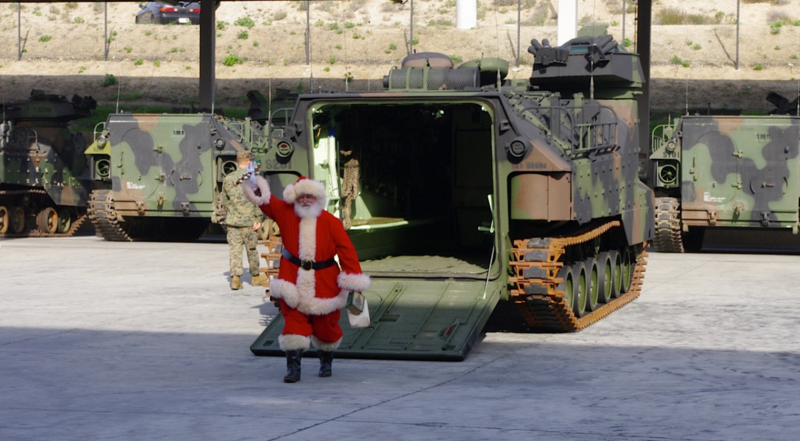 Delivery at Camp Pendleton Sunday, December 6th. By “adopting’ a family as part of “The Big Thank You”, the Sponsor individual or group provides gifts including a $150.00 debit card or gift card to the enlisted parents. Sponsors also provide each child five gifts from a provided ‘wish list’ (guideline limit $100.00 per child), a Holiday meal basket that includes anything from grocery script to fresh fruits, boxed or can goods, baked items other personal touches that make this basket a personal reflection of the Sponsor individual, family or group. Then Sponsors are given the opportunity to caravan with to Camp Pendleton and meet their ‘adopted’ family, enjoy a hot catered lunch and present their gifts. For those Sponsors who wish to ‘adopt’ a family but not wish to shop, wrap, caravan and deliver to their families, Bells of Freedom will provide the Sponsor with their ‘adopted’ family’s name and battalion and our Bells of Freedom volunteers will do the rest. Family adoptions start at $350.00 for a family of three. Adoptions begin October 20, 2014. Join the Staff, Families and Friends of Bells of Freedom and Begin a NEW Tradition for the Holidays. Your personal feelings aside, there are still thousands of our men and women serving in the military here and abroad in order to secure the freedom of Americans everywhere in the world. Many of the families of our military men and women are struggling every day just to ‘make ends meet’. By “adopting” military families during the Holiday season, it is our way of saying “Thank You” for the sacrifices made by these brave men and women (and their families) currently serving in the United States Armed Forces. The families we ‘adopt’ vary in race, ethnicity, culture, and religion. Their commonality is that they are all employed by the United States Armed Forces and that they are families that need an emotional, spiritual and financial boost. Can’t adopt an entire family? You can still participate! Ask us how we can match you with another sponsor family and ‘adopt’ a family together. Cash donations of any denomination go a long way when totaled up at the end of the day. Cash donations allow the Bells of Freedom program to help just one more military family in need or to go toward feeding the more than 700 military and sponsor family members on Sunday, December 6th. We also gladly accept gift cards to grocery, gas, clothing stores, etc.